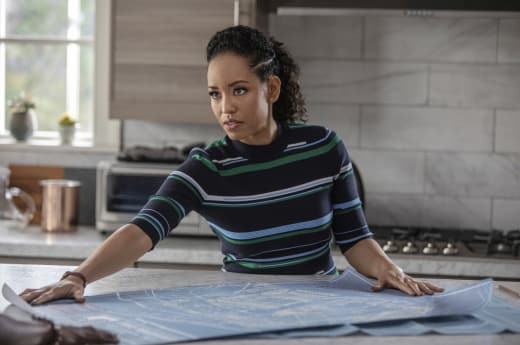 Charley Bordelon was on the verge of confronting the Laundry Enterprises board on Queen Sugar Season 3 Episode 8, but will it do her any good? I don't expect that any of these board members will care that the company may be using the EPA to get what they want, and certainly not while they have the cover of an EPA official in their pocket. Knowing that Charley and Nova were working together calmed my nerves a bit. They are both intelligent, tenacious women who will be a force to be reckoned with, but even they need to have their ducks in a row before they take on Sam Landry. I can only imagine that it won't be long before Sam's son, Colton, enters the picture, and I'm curious as to how he and Jacob get along. I'll guess not well, as Jacob seems insecure and Colton sounds like his father's shining star, even if he is off in Houston. But all of this comes down to real people losing their homes because Landry Enterprises has found a way to game the system to make more money. As though they don't have enough already. 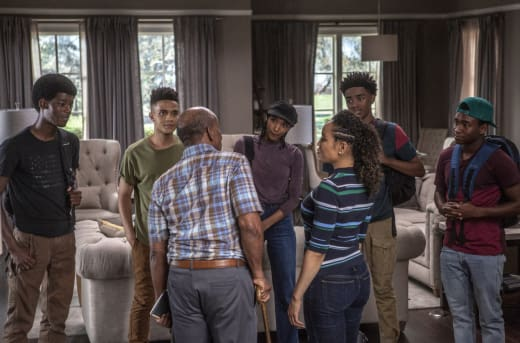 The way Prosper kept dodging Charley's questions about his daughter coming to help him move was a giveaway that she wasn't coming at all. Charley did the right thing by insisting that Prosper come to live with her and Micah. It's not like they don't have space. Prosper: Stubborn just like your daddy. Permalink: Stubborn just like your daddy. Prosper didn't look entirely comfortable amongst all of Charley's high-end belongings and I worry about him having to climb all of those stairs. I'm hoping that we get some more conversations between Prosper and Micah and his friends. I have the feeling they could learn a lot from one another. Speaking of Micah, I'm torn over their form of protest. Although I agree with the reason for the protest and the part where they will post signs with the slaves' names, I worry this could get all of them thrown in jail or worse. They were right when they said that the plantation only shows an idealized version of what life was like back then. The price of beautiful homes and pretty dresses was paid for in blood by people kept imprisoned their entire lives for no other reason than the color of their skin. I'd never thought about it quite that way until I watched Queen Sugar Season 3. Now I see what a travesty it is. Charley: My advice, stick to the terms, focus on Blue, and keep your emotions out of it. Permalink: Keep your emotions out of it. But Ralph Angel felt insecure when he saw the brand new room and all of the things that Darla could now give Blue. Darla wasn't asking for anything out of line. Blue is her son. Now that she's clean and sober, and has been for some time, it seems that full shared custody is in order. However, I could understand why Ralph Angel was upset. Blue has been his entire life and now he's being asked to share, and with a woman that lied to him for years. As much as Ralph Angel was right, Darla does have all of these nice things because of her parent's generosity, at least she's using them to be a better mother and offer her son a stable home. I can't fault her for that. Ralph Angel's bad mood spilled over onto Trinh. She felt him pulling away and didn't know why. I was glad he came back to talk to her, although there really wasn't much talking involved. I was hoping Ralph Angel would ask Trinh if she was willing to meet Darla, but that never happened. If Trinh's going to stick around, she and Darla will have to meet, Darla made that clear. Thankfully, Nova was their for Ralph Angel when he was at his lowest. He felt as though he wasn't doing enough for his son because Darla could give him a new bedroom and new toys, but he was missing the point. I'm sure if he asked Blue whether he wanted new things, or to spend more time with his father, he would choose the latter. Besides, Blue's car bed at Ralph Angel's looked pretty cool to me. Ralph Angel wanted to model himself after Ernest, but he didn't understand what Ernest had gone through until Nova explained it to him. Daddy was so busy trying to hide his pain, to do it all himself, it damn near broke him, but he survived it. He started the Farmer's Collective, doing everything you're doing now. You're not shouldering the burden alone, cause you got me, Charley, Aunt Vi, Hollywood. You don't need to take on more. Just stay the course, Ra. it was a relief to hear Ralph Angel turn down those extra shifts. Running the farm, holding down a job, and taking care of Blue is more than enough for anyone to handle. 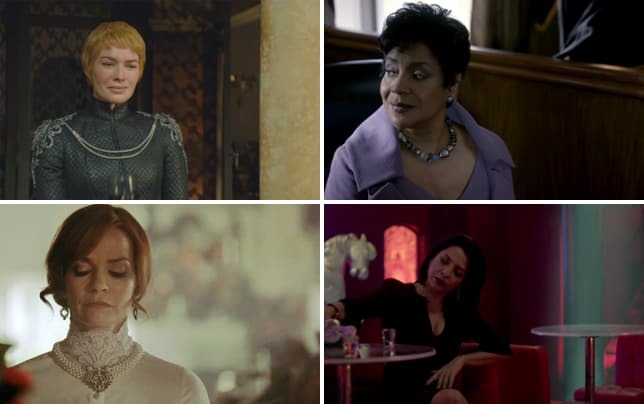 Finally, we got to Violet. I know Vi prides herself on her honesty and integrity, but she was already fighting for what she wanted with this business partnership. Telling Mr. Rollins that she was sick before the contracts were signed was naive. I'll be shocked if the deal he was offering doesn't change considerably, or disappear altogether. 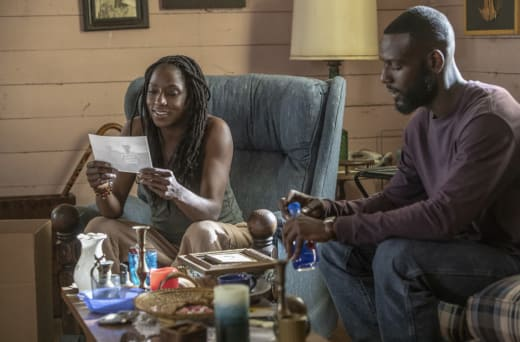 Check back for my review of Queen Sugar Season 3 Episode 9, and until then, you can watch Queen Sugar online here at TV Fanatic. [to Prosper] Ain't nothing wrong with asking for a little help if you need it. That's what family is for and we've been friends way too long. You family.